Nate Feuerstein, better known as NF, unleashes a new self-titled EP next week. Across six tracks, the 23-year-old Michigan artist shows off his impressive rhymes, singing talent, and passion for Jesus and music. NF has boldly shared the life struggles and past hurts that influence much of his music, including the loss of his mother at a young age. But he is also quick to share how God has grown him through great suffering, and reaches out to those who may relate to his story. Across the NF EP, NF spends time questioning identity, what shapes us and where true purpose is found. The EP opens with lead single All I Have, a clear standout track on the record. It’s a stirring piece with a strong beat, as NF sets things straight: he doesn’t live for the world, ‘I live for the King’. Nate acknowledges the honesty in his music (‘I take my pain and put it into song’) – a theme that will return throughout the record – and his ongoing struggles as he lives for Christ (‘I’m a Christian but I’m not perfect’). It’s a powerful start to the EP, and an encouraging one as NF raps with honesty and emotion. Wake Up starts with just piano and Nate’s voice but adds pounding drums and cinematic strings. It seems to be about someone who feels like their life is worthless, full of mistakes, and Nate tells them to open their eyes and wake up. Hands Up is a heavier track with screaming over a dubstep-ish beat. He shares that these songs are more than just music: ‘These songs are like the chapters of my life, and this is my book.’ My take from the track is that NF is living for Jesus, and having a great time doing hip-hop at the same time. Hence, why the hands are up. Musically, Only One brings a real shift. It’s an electronic party set upon a dubstep beat. It’s followed by Thing Called Love that questions what love is, and notes that it’s not seen in hurt: ‘It probably isn’t there if you’re struggling to find it’. It’s clear from this track that God’s love shown in Jesus is true love. Fallen humanity struggles to know what real love is, but the cross is where we see love made perfect. ‘Your love is like a privilege – a lot of us abuse it.’ It’s a haunting track. The album closes with a brutal beat on Just Being Me. NF defends his craft and love for making music. He shares how from an early age, music is what kept him on track, and is what has defined him. He questions the norm – (‘Whatever happened to music that meant something?’) – all the while realising that God gave him his story and the ability to share it through music. NF’s self-titled EP is a pumping release filled with honesty and musical skill. That Nate can both rap and sing and put together six solid tracks means we can expect some exciting things from him in future. I’m giving NF’s NF EP three-and-a-half out of five stars. 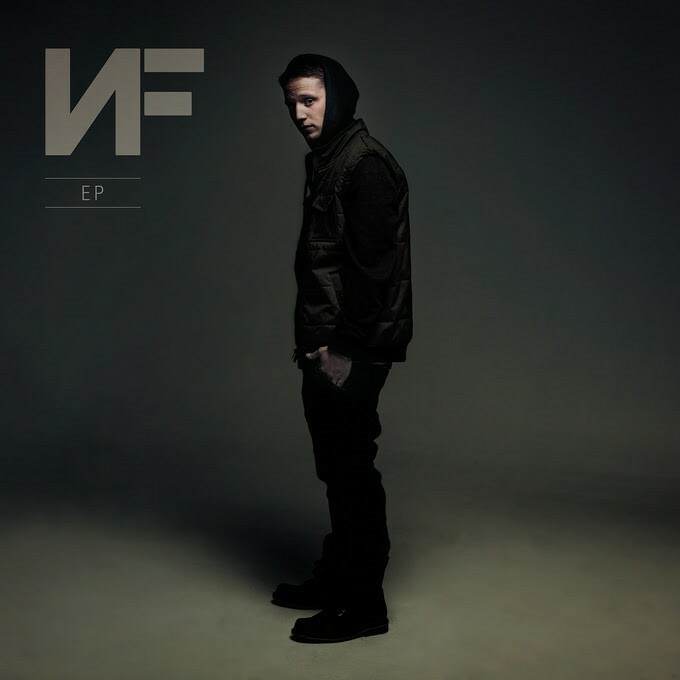 NF by NF will be released this Tuesday 5th August and will be available on iTunes. Read more about the EP in my interview with NF here. Posted in MusicTagged Album Review, christian, EP, Nate Feurerstein, NFBookmark the permalink.